Dr. Reid, the prosecution’s expert, clearly knows LITTLE about the drugs he and his colleagues regularly prescribe to patients – the same drugs prescribed to James Holmes which produce “psychosis” and “homicidal ideation” But if he admitted knowing such it would then point the blame on the drug makers and on him and his colleagues’ livelihood. Is that not a vested interest in not allowing the truth of this case to be told? If he admits the drugs pushed James Holmes into this as they have so MANY others: www.ssristories.NET are he and his colleagues any less guilty than someone who slips drugs/alcohol to someone who then commits a crime? It has already been made public that James Holmes was on Zoloft, a Selective Serotonin Reuptake Inhibitor – the same antidepressant initially given to Eric Harris from Columbine who was taken off the drug after only six weeks because he was having thoughts of killing that greatly disturbed him. Unfortunately his doctors apparently thought if the name of the drug was different, even though it was the same type of drug/same action in the brain, it would have a different effect upon Eric and switched him to the antidepressant called Luvox. Wrong move! Zoloft is often referred to as Prozac #2 and Luvox as Prozac #4 since they are clones to Prozac and work similarly in the brain. As you read the medical research below keep in mind that these SSRI antidepressants work by increasing levels of serotonin (5HT) in the brain. These drugs are known to produce both psychosis/schizophrenia and homicidal ideation. Ideation is a compulsion where you think obsessively of both homicide and ways to commit homicide – exactly what James Holmes described in his writings and interrogations. When a patient suffers this adverse reaction to the medications they long for anyone to stop them because the compulsion is so strong that they cannot stop themselves. James as so many others report was doing things he hoped would lead to someone who would stop him from doing what he was being chemically compelled to do. As you read this quote from my book Prozac: Panacea OR Pandora? – Our Serotonin Nightmare! it will help you see how similar in action these serotonergic drugs are to LSD and PCP, drugs we have seen in the past that are now illegal although once thought to be “safe and effective” while they were prescribed by physicians. This will also help explain the psychosis/schizophrenia producing effects. “Tonge and Leonard (1969) compared phencyclidine [PCP], Ditran, mescaline and LSD and their effect upon 5-HT (serotonin) and 5-HIAA (serotonin turnover). All four drugs increased brain 5-HT (serotonin) and decreased 5-HIAA [serotonin turnover/metabolism] over a three hour period. As we pointed out before inhibition of 5-HT (serotonin) is known to result in a decrease of 5-HIAA (serotonin turnover) while it increases extraneuronal content of the 5-HT (serotonin) (Buus, et al. 1975; Nabeshima, et al. 1983). Kenneth M. Johnson in 1978, thirty years after our official introduction to PCP, recommended that, “…Because of the suggestive nature of the foregoing studies with PCP and the proposed role of 5-HT [serotonin] in emotional and psychotic behavior, it is felt that a detailed biochemical study of the effects of PCP on serotonergic function is warranted…” (PCP PHENCYCLIDINE ABUSE: AN APPRAISAL , p. 46). 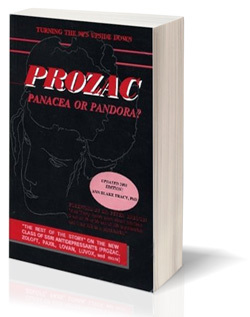 I have been going back through my book Prozac: Panacea OR Pandora? – Our Serotonin Nightmare! (Keep in mind that the only reason Prozac is the only antidepressant mentioned in the title is because it is the mother drug to all of the other SSRI and SNRI clones to follow it) to gather information for a court case and thought I would share something I ran across. It seems that so many who know enough to be against these drugs do not seem to know how simple it is to prove the deadly potential of antidepressants in producing psychotic breaks or so many other adverse effects. Hopefully just this one quote (although there is MUCH more) is enough to help everyone understand how similar in action these serotonergic drugs are to drugs we have seen in the past that are now illegal although once thought to be “safe and effective” also will help explain the psychosis producing effects. “Tonge and Leonard (1969) compared phencyclidine [PCP], Ditran, mescaline and LSD and their effect upon 5 – HT (serotonin) and 5 – HIAA (serotonin turnover). All four drugs increased brain 5-HT (serotonin) and decreased 5-HIAA [serotonin turnover/metabolism] over a three hour period. As we pointed out before inhibition of 5HT (serotonin) is known to result in a decrease of 5HIAA (serotonin turnover) while it increases extraneuronal content of the 5HT (serotonin) (Buus, et al. 1975; Nabeshima, et al. 1983). Kenneth M. Johnson in 1978, thirty years after our official introduction to PCP, recommended that, “…Because of the suggestive nature of the foregoing studies with PCP and the proposed role of 5-HT [serotonin] in emotional and psychotic behavior, it is felt that a detailed biochemical study of the effects of PCP on serotonergic function is warranted…” (PCP PHENCYCLIDINE ABUSE: AN APPRAISAL , p. 46). “This information on elevated serotonin levels and their connection to schizophrenia would imply that Prozac and the remaining SSRIs, along with any of the drugs which raise serotonin levels should all be classed as psychotomimetic drugs, over a period of use they are chemically inducing a psychosis thus mimicking schizophrenia. 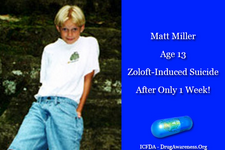 As early as 1986 Prozac’s potential to induce psychosis emerged when an FDA Safety Reviewer uncovered that Lilly had withheld information of psychotic episodes in 52 patients during Prozac’s clinical trials. Because so many remain unaware of how simple and reasonable it is to obtain this information and more information like this bombshell of info above let me explain what you can do to obtain hundreds of dollars worth of products for only $30. #1 My entire e-book with over 500 pages of information like this – the 2014 e-book edition of Prozac: Panacea OR Pandora? – Our Serotonin Nightmare! 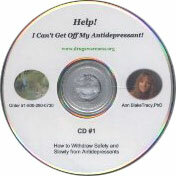 #2 My hour and a half long CD on safe withdrawal and tips on rebuilding after the use of antidepressants. #3 My DVD on Bipolar – Are you really bipolar or misdiagnosed due to the use of or abrupt discontinuation of an antidepressant? 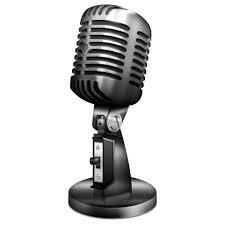 #9 Every radio and TV show I have done since 1990 on the SSRI antidepressants across this nation and around the world. There are dozens of shows available – some are even 4 hour overnight radio shows chocked full of information many of you have yet heard about these drugs and their adverse effects, not only upon the mind, but the body and offspring as well. And we are always adding more! A neurologist, who certainly should have known better, gave the SNRI antidepressant, Effexor, to 14 year old Jamie Tierney. Let her share with you what horrors she suffered as a result. Luckily her parents knew what they were seeing in Jamie’s behavior was not her and continued to search for answers. 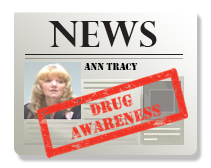 I still remember her mother’s first call to me and the hours upon hours spent in helping Jamie to be able to withdraw safely off of this deadly drug that almost took her life. And so common for so many young people who are targeted with these drugs as they enter college Jamie was offered the antidepressant Wellbutrin with the sales pitch that this antidepressant does not work like the other antidepressants (BS!) and it is safe so there is no need to worry. Jamie suffered the same nightmare all over again. Thankfully she survived that and has learned to avoid any of these drugs for the rest of her life! 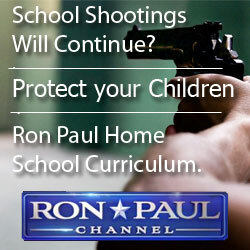 On the 16th anniversary of Columbine yet another school incident in Spain today. No matter the weapon, on an antidepressant the person will find the means to do what this young man just did and demonstrated for the world. “A 13-year-old student armed with a crossbow and machete killed a substitute teacher and wounded four other people Monday at his high school in Barcelona, Spain, before being taken into custody, police said. “He was very disturbed and saying strange and incoherent things. “Sometimes he was lucid and sometimes he wasn’t,” a relative told the site. Another neighbor said that the pair’s daughter had urged her mother to move in with her in Florida. “The daughter was saying, ‘Mom, come to me, because we know he’s not stable,’ ” the neighbor told CBS News. 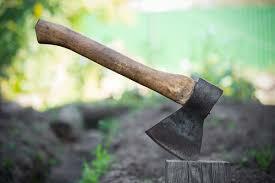 Then about three years ago in St. George, UT a 76 year old man used a hammer beat his 76 year old wife to death. The difference is that they had an ideal marriage according to all who knew them and taught a marriage and family class. The elderly and children are the two groups who suffer the most adverse reactions from any medication. When the FDA put the most serious warning of all next to an outright ban on antidepressants they issued a Black Box Warning for suicidal ideation for those under the age of 25. That warning should have been issued for those over the age of 60 as well at the same time. (Actually it should have been issued for any living being! But for the sake of this discussion we will focus on the elderly and the children – the two most vulnerable groups.) Suicidal ideation is little different from homicidal ideation other than who is the focus of the compulsions for killing – the patient or someone else. David Benson described the reaction of homicidal ideation perfectly above. It is constant ruminating thoughts of killing someone along with the same ruminating thoughts of various ways to kill.